I’m running late today, but I couldn’t ever forget the Friday Art Feature, especially when this week’s artist has such beautiful art. I just love everything about fantasy art. The colors, the magical element. It’s what inspires me. I get excited when I see an owl or beautiful butterfly wings. I want to go straight home and paint. I only wish I could paint faster. I get so many idea’s and have a book full of sketches. There is never a lack of idea’s I don’t recall how I started painting fantasy. I guess for me painting has always given me the feeling I could have anything I wanted because I could just paint it. Now I know this isn’t true but I still have that feeling inside. Like being a magician. So that could be why. So many things inspire me. A book I read, taking a walk through the woods, seeing a photograph or an animal. An interesting piece of clothing or jewelry. An outrageous hairstyle. You craft and sell beautiful wands and staves, as well as tarot boxes and spell books. Where do you sell them and how did you begin your craft? When I create my staffs and wands I look for objects to add. I went to Lake Superior in Wisconsin recently and found all sorts of goodies. White seagull feathers, interesting driftwood, shells and stones. When I find these things I feel it is a gift from the universe and these things belong together to create something powerful and magical. I sell a lot of my crafts in stores and shows. But mostly on the Internet. Several years ago I had an olive tree growing in my back yard. I used one of the larger branches for my first staff. It was the perfect size and shape. All sorts of interesting objects started popping up to be added to it. And my love for creating magical crafts was born. I was hooked. I usually put a crystal or amethyst on the top because I love them and love to buy them when I find really special ones. This way I can pass all these magical things along. I’d like to keep everything, but sharing is better. The world is so full! I have a lot of favorites. My cats are really fun, like Xavier the Great, my magician cat. But the one I will never part with is my Black Wolf. I feel that painting portrays my Totem animal. It may sound strange to alot of people, but I believe I was a wolf in a previous life. So the Black Wolf painting has a lot of meaning to me. If I’m working on an acrylic painting it takes me quite a bit longer than a watercolor. It really depends on the subject. How much is going on in the painting. I usually get an idea then search my reference files and the internet. I often ask my kids to model poses for me or look in a mirror. After I gather all my references I start putting them all together into a drawing then trace it onto a canvas once I get it just right. I’ve found this makes my paintings a lot crisper. I don’t wind up having to erase on the canvas which makes a huge mess. Because I erase ALOT! It also helps me to center things better. Lately I start painting the skin on the people first and work my way out leaving the details until last. Like the hair and the wing etc. I like to look at photos for color combinations, that helps a lot. That way I can see what I think looks good together. The mood or message I want to send. Or the story I want to tell. I would have to say Jasmine Beckett Griffith. She is an inspiration to me because of her marketing. I love some of her art too. She has a lot of talent. But you see her everywhere. She has so many products and is in so many markets and has such great success. It gives me hope that an artist can still make it in today’s world. I wish I had the time to devote that much time to my art. She is a wonderful artist and a brilliant business woman. I’m a movie buff. I go see all the new releases at the theater. I have all the frequent visitor cards. I also love to go to rummage sales and thrift stores. Talk about odd objects! I’m very active and love to workout at the gym doing classes. Zumba is my new favorite. I bike and walk and love to be outdoors. I also love to get together with friends or my sister and just hangout and talk. 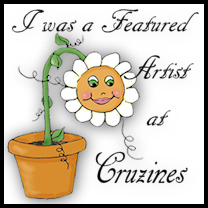 Want to see more of Lori’s art, follow her or visit her stores? Thank you Lori, for taking the time to do this interview. I’ve enjoyed seeing your art and getting to know you. Please feel free to grab the badge below for your website or blog. It’s also available on the side bar with the code already done for you. Drop by every Friday to meet more fabulous artists. Next week I’ll be featuring artist, Deirdre Moira Murphy. Posted in artist feature, Friday Art Feature and tagged art, artist, Lori Karels. Beautiful interview, I love Lori Karels art. Wow, I haven't heard of her but her art is beautiful! Thanks for the introduction.